Founded in 1993, Mercury Foodservice is an independent, family-owned and operated foodservice distributor proudly serving the Greater Hamilton area. A lifelong resident of Hamilton, George Papalazarou was raised in the family restaurant business. His family ran the Pioneer Restaurant at King and MacNab Streets until 1973 before deciding to go it alone with his own place in 1983. In 1990 George took a sales position with a local foodservice distributor and began learning the other side of the business. He understands the challenges of today’s restaurateur and is committed to helping them be successful by offering quality brand name products, competitive prices and customer service that is second to none. Those were the founding principles of Mercury Wholesale Foods and are still the benchmarks that we strive to provide to our many customers on a daily basis. Focused on reliable customer service, Mercury Foodservice believes in listening to our customers and striving to bring you the products that you need, at the price that you can afford. We offer a uniquely personal service, combined with a wide range of brand name products and local produce. From humble beginnings we provide service to restaurants and foodservice operations across the greater Hamilton area. As a member of National Brand Marketing we have the purchasing power of almost 150 distributors across Canada. 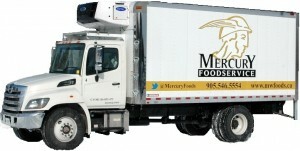 Mercury Foodservice belongs to two buying groups: Associated Food Distributors and ITWAL. AFD is a foodservice marketing group representing 40 Foodservice Distribution companies and 120 locations nationally. AFD has always maintained a national brand philosophy and continues to support the National Branded Manufacturers. Their buying power helps us to bring you the best nationally branded products at the most competitive prices. ITWAL Ltd. was founded in 1966 by a small group of independent wholesale distributors in Southern Ontario. They formed ITWAL to combine their collective buying power thereby enabling them to compete effectively for the benefit of their customers.